Generations have grown up learning baseball through the inimitable voice of Jerry Coleman, who spent four decades in the San Diego Padres broadcast booth. He was truly an American institution, serving heroically in World War II and the Korean War, serving 22 years (1942-64) in the Marines as an aviator, and earning four World Series rings as a Yankees second baseman. The Padres and all fans are mourning Jerry’s passing on Sunday at the age of 89, and we invite you to share your condolences and stories here, using the comments below. I lived in an apartment on Clairemont Mesa Blvd and could see the lights at night from the Murph. I would go to bed with the am radio listening to the Padres game with Jerry Coleman. Back in the eighties. Good Stuff! Tomorrow is Opening Day. I never miss it. But this year, well, this year it’s just going to be a little sad knowing that the Col.’s voice is silenced. Ted…..I’ll be praying for you, too. It’s up to you now, Ted, to get that STAR out there! I know it won’t be the same for any of us who just adored Jerry. But we’ll all think of him when we see the STAR! I found out this weekend, in Las Vegas, at an Oracle convention. It floors me. I ran into some Scripps personnel and they told me about our loss. Jerry. The Colonel. 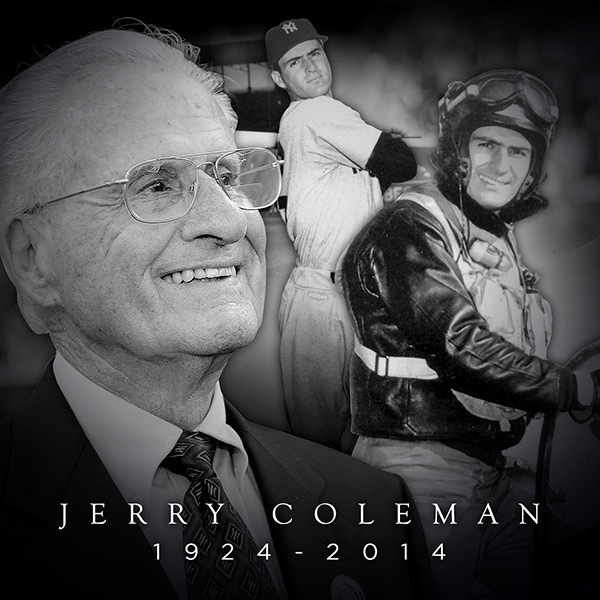 Jerry Coleman is the voice that’s carried me through many afternoons and evenings, as I enjoy my pastime. I started watching baseball in San Diego at about 5 years old, that would be 1984. That voice, and of course Uncle Teddy, ARE baseball afternoons. First at the Murph with my Coke, peanuts, and a dog as a kid, then later with perhaps an adult beverage or 5 and everything you can put in a bowl or plate into and out of the Gaslamp Quarter, there was ALWAYS the Col. and Uncle Teddy to walk with you through fire sales, bad trades, bad seasons, more bad seasons, and then the eventual, shocking, “WE’RE GOING TO THE PLAYOFFS,” moments that we as Padre fans knew would NOT last forever. But dammit we enjoy our extra baseball when we get it, don’t we friends? My first games as a kid in the car or in my room, or listening on those give-away AM radio headsets during the game at the Murph, my first listening via the internet, the Col. was always the voice that was calming, funny on purpose and sometimes by accident, humble, and after I moved to the SF Bay Area for work, his voice was HOME. A small piece of home away from home for a decade plus as the boys of summer join us one more time to show us why you can’t just look at the scouting reports, you have to play the game. I was looking forward to this season, wondering how many games he’d join us for, or if perhaps he’d throw in the towel and we’d get to honor him, Hoffman and Gwynn style, with a hell of a send-off. I’ll be there for any send-off he gets, but there will be an empty seat at the party. IF I’M EMPEROR… I’d replace the word “Padres” with “Jerry” across the jersey chest this year. However for a humble man like Jerry Coleman that would be over the top and I’m sure he’d shoot that down… No pun intended. How about a patch with 2 crossed baseball bats, a silver oak leaf in the left quadrant, USMC Globe and Anchor in the right, American flag in the top quadrant, and the Padres logo in the bottom quadrant. Around the border, his name, and years of service with MY Padres. That logo should be on every paper schedule, every web page, every uniform, every give away, on every broadcast booth, every entrance to the park, on banners in the Gaslamp, on the trolley cars, and of course, on the cover of every program. Uncle Teddy, outside of my own family and the Col., no voice and face has been associated with more memories and emotional swings, from elation to anger, confusion to sadness. We the people of the Padre Nation declare you may not engage in any activity that endangers yourself in any way, so that we keep as long as possible the last voice we have that’s carried us through management changes, spring training, pre-games, line-ups, pinch-hitters, position changes, double-plays, pitching duels, extra innings, your Padres, MY Padres, our memories, our club, our home. Jerry Coleman, LtC, USMC (Ret. ), what a life, what a career. You can hang a star on that one, baby. I’m hoping the ceremony tomorrow is carried on FSNSD or on padres.com for those of us that can’t make it.